After you have generated lots of ideas and then selected the best ideas for solving a problem, how do you evaluate those ideas to build the idea instead of destroying it in the process of evaluation? The method that I have used for years, and invented with my colleagues Diane Foucar-Szocki and Bill Shepard is called Pluses, Potentials and Concerns or PPC for short. List at least three good things about the idea. These three traits are the pluses of the idea. They are the strengths or positive aspects of the concept. This is what’s good about the idea, at face value, right now. List the concerns about the idea. Concerns must be worded as problem statements if this technique is to work. Problem statements begin with the words, “How to…” or “How might I… .” When the concerns are phrased like a problem statement, your mind recognizes them as something that can be solved and almost immediately begins to generate ideas for overcoming that concern. For example, if the concern is that the idea will cost too much, rephrase your concern as “How to reduce the cost?” or “How to find the money to develop the idea?” By phrasing concerns in this way, you can generate ideas to overcome the concern, strengthen the concept, and increase its chances for acceptance. 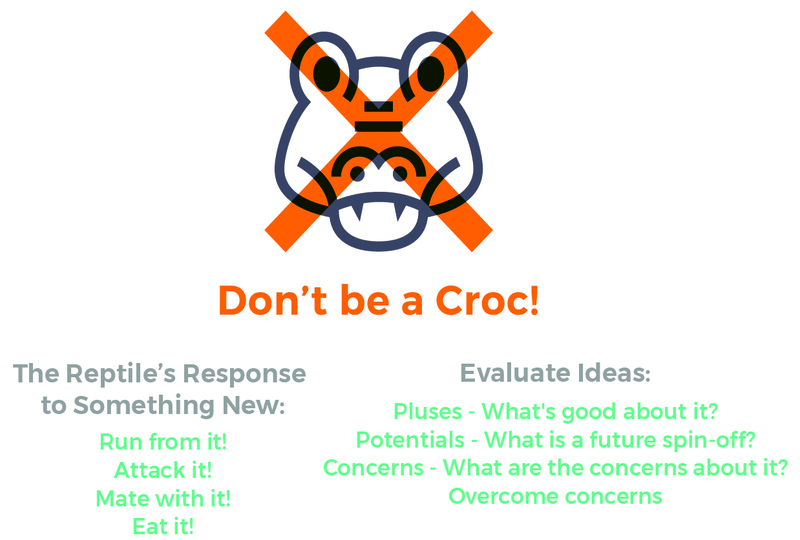 This is a positive, proactive approach to evaluating and building ideas. Overcome your concerns about the idea. After you have listed your concerns, generate ways to overcome each one of them, one concern at a time. Decide which concern should be overcome first. Sometimes when people tackle their toughest concern first, one or even two of their other concerns evaporate. As a result of overcoming the concerns about the idea, the idea gets better, more refined and is often ready to be implemented. As a result of overcoming the concerns about the idea, the idea gets better, more refined and is often ready to be implemented. Try using the PPC technique next time someone presents you with a new idea. Let me know how it works for you… and how the person reacted when your first response to their idea was a positive comment. Learn more about the Power of the PPC in my book, Leading on the Creative Edge. Next time someone proposes a new idea to you, instead of telling them all the reasons why it won’t work, find at least three good things about the idea. How did that person react when you praised their idea instead of criticizing the idea? Please let me know in the comments below.